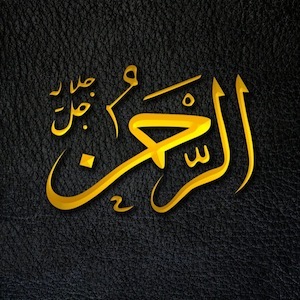 The first words that begin the journey through the Qur’an are: “In the Name of God, the Entirely Merciful, the Especially Merciful (ar-Rahman, ar-Raheem),” (1:1). We begin the journey of knowing God through His Mercy. This is the way in which God introduces Himself to us—not with the names that indicate majesty and strength. So in this journey of understanding God's Names, it is only fitting that we speak of His All-Encompassing mercy. Rahman and Raheem both come from the same root of ra-haa-meem (ر-ح-م), which means “ar-riqqa wAl-ta’atuf”—a combination of tenderness and compassion. Rahman is a mercy that comes from one's essence; it needs no effort to express; is absolutely selfless; and is given to everyone. This is why 'Rahman' is only for God. We are all recipients of God's Mercy every single day. The plants, animals and humans. Men and women. Young and old. Muslim and non-Muslim. These mercies come in the form of all of the blessings in our lives, from the earth itself to our loved ones. God tells us, “And out of His mercy He made for you the night and the day that you may rest therein and [by day] seek from His bounty and [that] perhaps you will be grateful,” (Qur’an, 28:73). These are the things that we don’t even realize, but we all benefit from. A cool breeze on a warm day. Rain after drought. The trees that purify the air for us. We are all recipients of this mercy.